Madrid (AFP) - Germany's Maximilian Schachmann consolidated his overall lead in the Tour of the Basque Country on Thursday by claiming his third stage victory in four days. 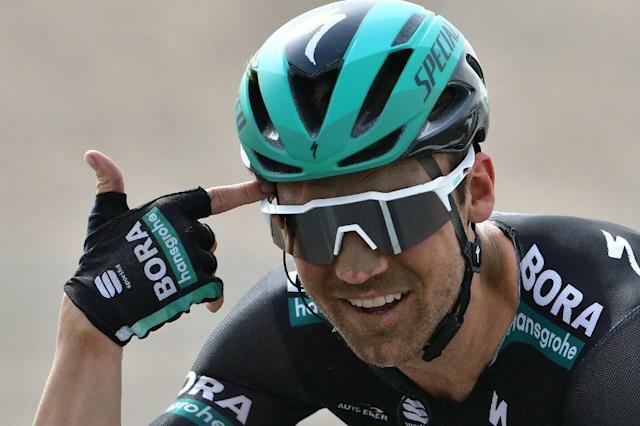 The Bora-Hansgrohe rider broke away three kilometres from the finish with a group of four before edging out Tadej Pogacar (UAE-Emirates), Jakob Fuglsang (Astana) and Adam Yates (Mitchelton-Scott) in the sprint. After falling in a nasty crash on Wednesday, Frenchman Julian Alaphilippe (Deceuninck-Quick Step) and the Spaniard Jonathan Castroviejo (Sky) were both unable to start. Schachmann's win means the 25-year-old extends his advantage in the overall standings to 51 seconds, with Patrick Konrad second and Ion Izagirre in third. "I knew it was possible to win again but to do it is really special," Schachmann said. "It was very difficult during the climb and I had to dig really deep. "In the downhill, it was Pogacar I think, he went so fast and I was at my limit. On two corners I really felt the tyres slipping but I handled it and in the end I was in the perfect position to launch a good sprint." The event continues on Friday with the fifth stage, a 149.8km route between Arrigorriaga to Arrate.